I have two quilts that are nearly finished. I have been putting off the last hour or so of finishing as they don't have a home to go to, so I've been doing other projects instead. However, I am getting to the stage where I need the space, so I would like these to go to a good home. Please have a look at them and help me out - do you think of a deserving person or charity when you see these? Can you suggest someone who would appreciate one? 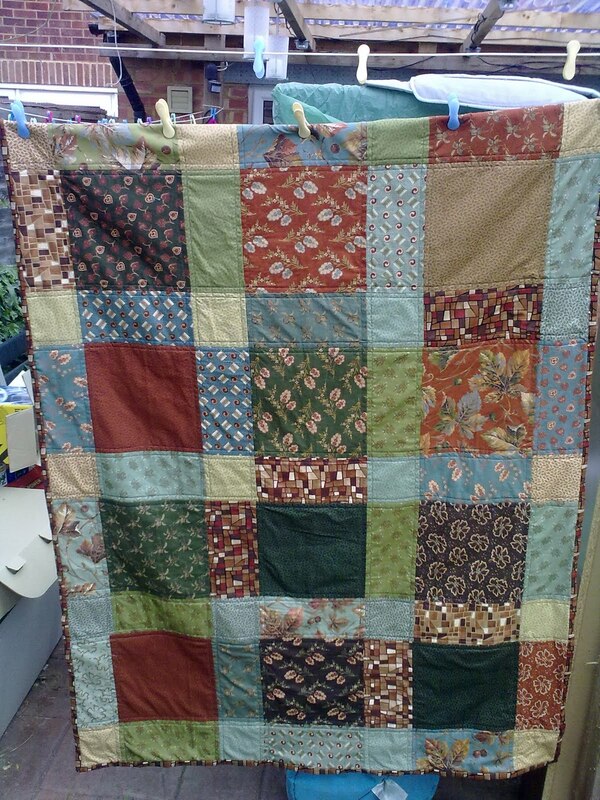 Please can you use the comment form to suggest either an international charity, or a UK based charity or deserving cause, and I'll pick two suggestions next weekend and send the quilts. and a Zig Zag rail fence. I donate all my stuff to the Guardian ad Litem program in my home town. They go to kids who have been removed from their homes by the court system. Didn't know if you want to ship though. Is there not a nursing or residential home near you? Or there's always project Linus. Quilts for Japan? Project Linus? Foster Network? Quilts of Valour? 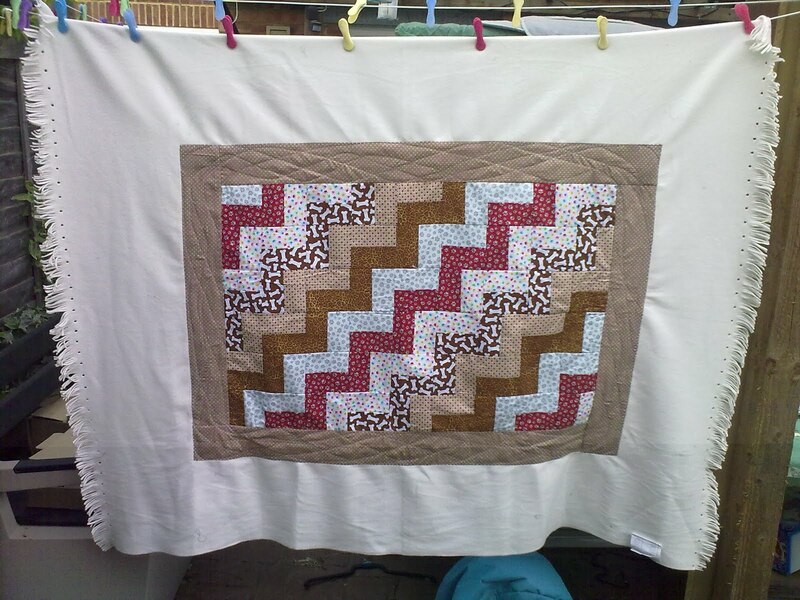 Midsomer Quilting for the first one and I can help with contact details for the other three if you need help..... It is hard when you have lots of quilts and ideas without knowing the exact destination of them, isn't it? Mind you, I quite often leave a small quilt in the back of the cupboard so that I've got something to hand if I want a quick, but still special, present. Hello Benta! First I love the fabrics you showed in your last post - especially the first for curtains! Your quilts are again so beautiful! 'Disappearing 9 patches' is so good pattern! I have the same white fleece waiting but it was too small to my blue top so I need to do other top for that. 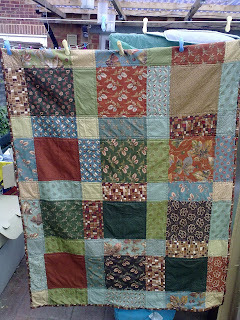 About new home ... first I was thinking The Olympics where many are doing quilts. But perhaps even better would be a child or what about the children hospital. What ever you decided, you'll make someone very happy! Ps. Thank you so much for your sweet words on my Mother's Day post! A lot of wonderful suggestions, but I think you should look close to home - a senior center, youth home, or children's hospital would certainly give your quilts lots of love. The international Salvation Army never has enough of anything to go around to all who ask help from it. Please would you consider giving the larger quilt to them? beautiful quilts i would think that a residential home would be good or a hospital . G'day Benta! I saw Heston Blumenthal on the tv a couple of weeks ago at a children's hospital in the UK somewhere. I can't remember which one it was....It was a long way from here in Perth, West Oz! Have you thought about a children's hospital? I'm guessing that hospitals take quilts like they do here. Benta, I think some nursing home elder would love to have a quilt. These people are so deserving. Many are put their by their families, who no longer want to bother with them or they just don't have any family at all, and I'm sure they would enjoy a gift of comfort, something that they can call theirs. I'd look locally for a nursing home or adult care center. Debbie from the USA! Oh such pretty quilts. I also agree that it would be nice somewhere closer to home. Very kind of you. I enjoyed your post at Stash Manicure! I left a suggestion there, but I agree with the others - it would be nice to select a place close to you. Thanks for sharing your FQ bag, and your lovely quilts! Thanks for the great tutorial. Very clever of you. i can think of several people to make it for starting as a gift bag that keeps on giving. I am so darn excited!! 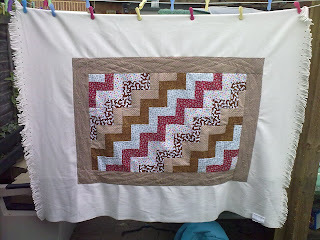 I came by your blog through a site from a suggestion on www.quiltingboard.com and the place on that site, took me to yours! I just made two of your little FQ bags from some OLD (but goodies) FQ's and I love them. I have one 3 1/2 yr. old GD and I promised bags for small toys but haven't found a quick, fun, easy one till now! Many more to come. Thank you, thank you, thank you!! I think Japan would be good or Joplin, Missouri, USA was just hit Sunday, May 22 by a devasting tornado. Most of a mainly blue collar town of 50,000 was destroyed. The Red Cross would certainly give it to someone (or Salvation Army).